From time to time an animal comes into foster that for one reason or another becomes a sanctuary pet. This may be for medical reasons, because the animal has been through several trial adoptions and returned, they may be feral, skittish or elderly. Because of our commitment to these rescued animals, those that end up as a sanctuary will remain to live out their lives. Occasionally, someone will inquire as to adoption of a sanctuary, and that is certainly possible, or if you would like to sponsor one of our sanctuary animals, let us know and we will acknowledge your sponsorship under that pet. For just $10-$20 a month, sponsor one of the animals listed below for as long as you like. This sponsorship will help pay for food, medical needs, litter, etc. If you are interested in sponsoring one of our sanctuary animals, please contact Cindy@koolkatrescues.org or 344-2063. LUKA is an oddity. 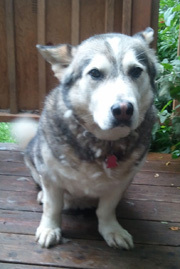 He has the body type and build of a corgi, but the hair, curly tail and ears of a husky and boy is he stubborn. Has a mind of his own and looks at you like "I don't have to listen to you" if he is off leash and starts investigating new surroundings. 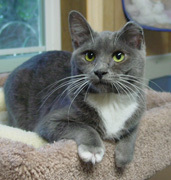 His family dumped him at Anchorage Animal Control when he was 9-1/2 years of age, unneutered. No one seemed interested in this funny looking dog, so I pulled him out after he'd been there for awhile, as it didn't seem anyone wanted a older dog. He is now 15 years old and starting to slow down and even though he can be a real butthead at times, I have never regretted my decision to make him part of rescue. CHANCE came into rescue when he was 6 weeks old. He was badly frostbitten, underweight and extremely dehydrated. Weighing in at 14 ounces, this terrified little boy wasn't long for this world in his present situation. He lost one ear and all but two toes and most of his tail due to frostbite. He hops like a bunny getting around and has no problems scaling a cat post. Though he only has his two front side toenails, you'd never know it and he can use them like he has a full set to cat claws. He is my sweet boy who will be my little sanctuary kitty for life. He was profiled in Cat of the Day for Memorial Day in 2011 and made lots of new internet friends. 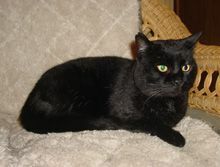 SANTANA is a DSH black cat with specks of white fur throughout and is estimated to be about 8-11+ years of age. This 18# hunk-a-hunk of burning love, is extremely vocal. Had been a stray for awhile, fending for himself while a kind neighbor tried to keep him fed. The ferals in the neighborhood keep picking fights with him and she became concerned for his safety. Once he is comfortable is his surroundings he will follow you around like a puppy dog. Since he can't be trusted not to get outside (as his last walkabout, he was gone for a month before he was traced back to me via his microchip), his foster mom decided he can stay here since he seems to be so happy. 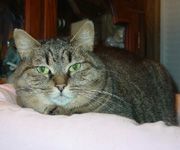 EVELYN is a DSH tabby cat approximately 11-1/2 years of age and has been in rescue for 6 of those years so we moved her over to the sanctuary page. When she was 3 years of age, her previous owners moved out of the apartment and left Evelyn to fend for herself until she was found by the landlord who promptly dropped her off at Anchorage Animal Control. Evelyn is getting set in her ways, and the one time she went into trial placement she did not do well and was returned within a matter of days. AFTER 11 YEARS IN FOSTER,EVELYN IS IN TRIAL PLACEMENT. FINGERS CROSSED, WAY TO GO EVELYN!!! 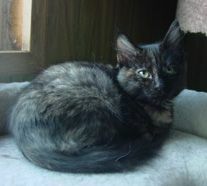 Thank you for considering a Kool Kat Rescue Cat!